Every Christmas my Mom would buy us a box of Chocolate Turtles. Oh how I loved the combination of chocolate, chewy caramel and crunchy pecans. I had those three components in mind when I made these Turtle Brownies. The words decadent and delicious is how I would describe these fudgy brownies that are covered with a smooth caramel mixed with chunks of toasted pecans. And what could be better than topping them with a extra drizzling of dark chocolate. The brownies are made with unsweetened chocolate which gives them a deep chocolate flavor. Unsweetened chocolate is chocolate in its rawest form which means it does not contain sugar so that is why this recipe uses more sugar than brownie recipes that use semi sweet chocolate. Do not overbake these brownies as we want them moist and fudgy, not dry tasting. So bake them until there are still moist crumbs clinging to the toothpick that has been inserted into the center of the brownies. Once the brownies are baked, the next step is to make the caramel. 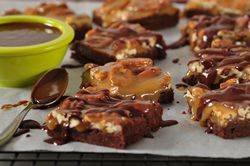 You want to spread the warm caramel over the baked brownies that are still warm. Now, I offer you two ways to do this; one is to simply melt store bought caramels (Kraft are my favorite) with a little heavy cream. The second way is to make your own caramel sauce. If you decide to make your own caramel, it is important to cook the sauce until it is a nice golden brown (caramel) color. While you should not stir the sauce once it boils, it is a good idea to swirl the pan every once and a while so the caramel cooks evenly. Also, do not cook the caramel over too high a heat as we don't want the caramel to burn. Turtle Brownies: Preheat your oven to 325 degrees F (165 degrees C) and place your oven rack in the center of the oven. Line the bottom and sides of an 8 inch (20 cm) square baking pan with aluminum foil. Lightly butter the foil, or spray with a non stick cooking spray. First, melt the chocolate and butter in a large stainless steel bowl placed over a saucepan of simmering water. Remove from heat and whisk in the sugar. Next, whisk in the vanilla extract. Add the eggs, one at a time, whisking well after each addition. Finally, stir in the flour and salt. Pour into the prepared pan and bake for about 25 minutes, or until a toothpick inserted into the center has a few moist crumbs clinging to it. Remove from oven and place on a wire rack to cool while you make the caramel. Caramel Topping: In a medium sized, heavy bottomed saucepan, combine the sugar, corn syrup, water, and salt. Over medium heat, stirring constantly, bring the mixture to a boil. Once it boils, stop stirring, and cook the mixture until it turns a golden brown (caramel) color. This will take about 10-12 minutes. Adjust the heat, as necessary, to keep the caramel at a low boil. (Swirl the pan as needed so the caramel cooks evenly.) Remove from heat and carefully whisk in the cream and vanilla (the mixture will sputter and steam so be careful). Stir in the pecans. Pour the caramel over the still warm brownie layer, spreading evenly. Let cool to room temperature, then cover and refrigerate brownies for about an hour or until the brownies are firm. When firm, remove the brownies from the refrigerator. Lift the brownies from the pan by holding the edges of the foil. Place on a cutting board. Chocolate Topping: Place the chopped chocolate and cream in a small microwaveable bowl. Heat in the microwave until the chocolate has melted. Stir until smooth. Let cool to room temperature. Then place the melted chocolate in a small piping bag and drizzle the chocolate over the brownies. Place on a baking sheet and refrigerate until the chocolate has set. Then, with a sharp knife, cut into 36 small brownies. Store, covered, in the refrigerator for 5-7 days, or in the freezer for a couple of months. Makes about 36 small brownies. Preparation time 1 hour. Note: To toast pecans - Bake in a 325 degree F (165 degree C) oven for about 6-8 minutes or until lightly browned and fragrant. Let cool and then coarsely chop.